With the combination of some great tools like ipvs (Kernel Module for Virtual Servers), Linux HA (Heartbeat – great tool for Linux clustering), Ldirectord (the monitor / failover tool for ipvs), Ganglia (a great cluster toolkit that measures performance) and some custom tools that used in order to achieve session affinity (Layer 4 Load Balancing) and session replication / syslog alerting. “In computing, load balancing is a technique used to spread work load among many processes, computers, networks, disks or other resources, so that no single resource is overloaded. One way to archive this is by using the technique of virtual servers. Virtual server is a highly scalable and highly available server built on a cluster of real servers. The architecture of server cluster is fully transparent to end users, and the users interact with the system as if it were only a single high-performance virtual server. Build a high-performance and highly available server using clustering technology, which provides good scalability, reliability and availability. 2 Linux servers as load balancers with 2 network interfaces both (balancer1 – eth0:10.0.0.3 and eth1:10.10.10.3 and balancer2 – eth0:10.0.0.5 and eth1:10.10.10.5). 2 Linux servers that will serve web, ftp, pop and smtp services (linux1-10.0.0.10 and linux2-10.0.0.20). 2 Windows servers that will serve web, ftp services (windows1-10.0.0.50 and windows2-10.0.0.60). The image below shows how we interconnect them and prepare their networks for the cluster installation. In the example we used Linux Redhat Enterprise for the load balancers with custom compiled 2.6.7 kernel and custom compiled ipvsadm / linux-ha, but the installation of all the components must be pretty much the same for all linux distributions. We recommend a minimal linux installation, with only the desired packages installed. You also need most of development packages in order to successfully compile everything you need. #       Must have exactly one auth directive at the front. #       Available methods: crc sha1, md5. Crc doesn't need/want a key. #       sha1 is believed to be the "best", md5 next best. #       crc adds no security, except from packet corruption. #               Use only on physically secure networks. #                  THE ORDER OF DIRECTIVE MATTERS! #                  et al are set before the heartbeat media are defined! #       required and messages will be sent there. #       keepalive: how long between heartbeats? #       warntime: how long before issuing "late heartbeat" warning? #       See the FAQ for how to use warntime to tune deadtime. #       we have a separate dead time for when things first come up. #       It should be at least twice the normal dead time. #       on whatever node is serving it until that node fails. #       "nice" behavior (unless you want to do active-active). #       What UDP port to use for communication? #       What interfaces to broadcast heartbeats over? #       [loop]          toggles loopback for outbound multicast heartbeats. #                       This field should always be set to 0. #       a minute, then our machine will reboot. #       You can configure multiple stonith devices using this directive. #              to or * to mean it is accessible from any host. #       "administrative" or fixed IP addresses in this file. #       The haresources files MUST BE IDENTICAL on all nodes of the cluster. #       up on the preferred nodes - any time they're up. #       will be used in the case of a simultaneous start-up. #       BUT FOR ALL OF THESE CASES, the haresources files MUST BE IDENTICAL. #       taken over after going down. #       Each logical line in the file constitutes a "resource group". #       to line by ending the lines with backslashes ("\"). #       of scripts to run to "start" or "stop" the given resource. #       part after the :: is passed to the resource script as an argument. #       up here -- we key off of it. #       an IP address defaults to the highest address on the subnet. #       netmask as the route that it selected in in the step above. #       same netmask as the route that it selected in in the step above. #       this as IPaddr::135.9.8.7/24 . #       use to get at highly available services. #       you will probably only put one system name and one IP address in here. #       The name you give the address to is the name of the default "hot"
#       it is shown as owning. #       be a short name or a FQDN. #       An example where a shared filesystem is to be used. #       the delimiter '::' to separate each argument. #       virtual in any sense of the word. (Or you can copy /etc/init.d/ldirectord to /etc/ha.d/resource.d/ldirectord). # Sample ldirectord configuration file to configure various virtual services. # pool then localhost:80 is added to the pool as a fallback measure. 1 page test.html in virtual host test1.syslog.gr that contains the string “test page” on both linux servers. 1 page test.html in virtual host test2.syslog.gr that contains the string “test page” on both windows servers. 1 user testuser1 with password testpass that can login to linux ftp servers. 1 user testuser2 with password testpass that can login to windows ftp servers. With the option persistent enabled, we assure that every request from clients will end to the same real server, so we will not have problems with services that require session affinity (Layer 4 loadbalancing for FTP / POP / HTTPS etc.). If the real server fails, ldirectord will clear the real server from the load balancing table immediately (option quiescent=no). We can also change the weight for the real servers, if we have for example a more powerful machine as linux1 than linux2. 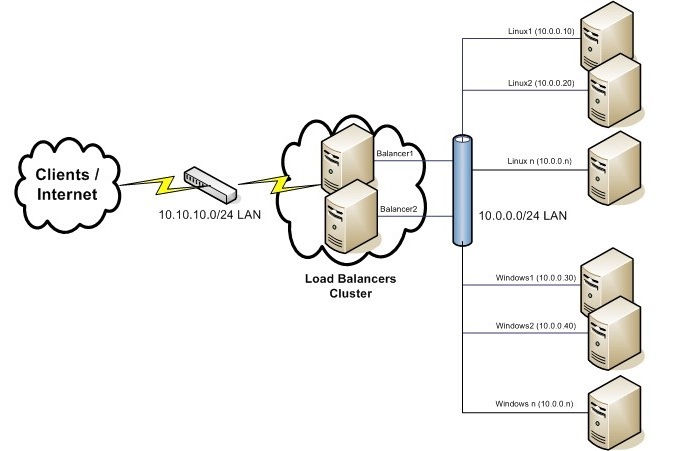 The load balancing algorithm that we chose is wlc (Weight Least Connection). If this compiles ok you can now see/administer ipvs through the command ipvsadm. logger "Active Node: Stopping Backup Daemon"
With this setup you can achieve high performance, avaliability, scalability and reliability using this linux layer 4 load balancing cluster (which is much cheaper than Cisco CSS/CSM module – Local Director). In many of our production environments (real life conditions) we have many linux clusters of 2 linux boxes with 2 hyperthreading Pentium 4 @ 2.8GHz handling over 20.000 connections at peak time, and over 80 MBits/sec bandwidth, using only 10%-15% of their cpu. For monitoring the resources of our cluster we used a great tool for clustering environments, ganglia ( http://ganglia.sourceforge.net/ ).